Well we're finally here, it's been uncharted territory for most of 2013 but Roger finally scored his first win against a top 10 player since the Australian Open as he defeated Juan Martin Del Potro in 3 sets to move into the Semi Finals at the Paris Masters. To say it's been a long time coming is an understatement but after today's performance it was almost worth the wait as we were treated to some great tennis with Roger playing the most consistent match I've seen for some time. It wasn't quite peRFect from start to finish but it was pretty close; the first set was near JesusFed level and then regrouping for the third to break three times in a row was the icing on the cake. Like most of his matches of late Roger was out the blocks quickly, firing down 2 aces in his opening service game that he held to love. He then had a break point chance immediately with some great play but wasted it when he went inside in with a forehand that sailed long. That missed opportunity didn't have an effect though as he held comfortably and then got the breakthrough in the next game with some really good point construction and variation that threw Del Potro completely out of sync. After holding for 3-1 we were treated to a bit of a masterclass in mixing up the pace and using the drop shot to catch Del Potro off guard to dominate pretty much every point. To be honest Roger should have broken again as he had plenty inroads and only Del Potro's clutch serves kept in within striking distance. After struggling to close out sets against Anderson there were some question marks other whether Roger would serve it out at 5-3 but he did so without difficulty holding to love and winning that all important first set. I thought after such a strong display in the first set Fed was getting this one done in straights and it looked like he was going to early getting several 0-30 and 30 all chances on the Del Potro serve whilst holding comfortably himself but he just couldn't quite get the breakthrough. Del Potro definitely upped his game in that second set by serving bombs but Roger gave him a chance to get into a rhythm by choosing to just rally with him from the back of the court. Seems like he forgot that the drop shot won him several key points in the first set as he failed to use it once in the 2nd set. That ultimately turned out to cost him as at 4-5 he played a very hesitant service game to get broken which leveled the match at 1 set a piece. After disappointingly dropping serve at the end of the second it was important Roger managed to regroup quickly for the decider, Del Potro had the fortune of serving first too which made it that bit trickier as Fed was now playing catchup despite being in front for most of the match. I was slightly concerned at 0-1 when a flukey net cord return gave Del Potro 0-15 but Roger held comfortably and then put together a great return game at 2-2 to break Del Potro to love. That wasn't the end of the drama though as in true Roger style he dropped serve immediately with a slightly reckless service game coupled with some Del Potro wrecking ball forehands on the return. However unlike Basel this didn't phase Roger as he broke Del Potro's very next service game, held to love and then broke Del Potro for the third time in the set to seal the deal 6-3 4-6 6-3. Boom! One of the cleanest matches you will ever see from Roger. Solid in all areas. Well what you can say other than it's quite enjoyable to see Roger can still play tennis when he wants to huh? I think this was one his best matches in a long time and even though the scoreline suggests it was quite close I thought he was by far and away the better player on court today. We got to see a little bit of everything including some genius drop shots and powerful first serving from the GOAT. The first set was ridiculously good from him as he hit 17 winners to only 4 unforced errors, couple that with 77% first serves and there's no way he's losing a set with those kind of numbers. Dropping the second was a little disappointing but who cares? **** happens sometimes so I'm just happy Roger hit back to get it done in the third. This match was almost must win and seems Roger knows it too as he kept his focus and intensity levels high. There are only so many losses where you can keep talking about positives and we've had enough of that with Monfils in Shanghai and Del Potro in Basel last week so to win here was very important. So this is the first meeting between these two since last years World Tour Finals where Djokovic prevailed in straight sets to take the title. That one was a real rollercoaster match and Roger threw away the lead in the match a couple of times at key moments so probably has some regrets in that match he wants to put right. Because it's been a while since they have both played it's quite difficult to know totally what to expect, Djoker has looked in serious form since the US Open, winning Beijing and Shanghai and he swept aside Wawrinka today rather easily. Probably the scariest thing is how he crushed Isner the round before; after losing the first set in a tie break he won the next 2 sets 6-1 6-2. Ok I expect Djokovic to win against the American but he completely crushed a guy with a huge serve. That shows you just how well Roger is going to have to serve to get it done I feel, today was a great serving display so we'll need even more of that; it has to be with pinpoint accuracy otherwise he'll be in trouble. I always back Roger to break Novak's serve but it's imperative he can keep hold of his own. I think the most important serve for when Roger is playing well is his one down the T on the ad court, he usually goes for that when he's feeling confident and makes it, so watch out for that one. Whilst it's been a while since they played there's no real secrets as to how both guys will setup to play – Roger will go aggressive and Novak will look to hang in the rallies whilst still playing somewhat aggressive himself. If Roger can be the one making more of the plays and his groundstrokes hold up off both wings I fancy his chances here. His winning % of points at the net as been great all week so I hope he comes in a lot to try end points when he has the chance. We always see the best of Fed when he throws in a ton of variety, every point ends up being different be it a serve and volley, a dropshot, a chip charge he can keep his opponent guessing and it really does make them doubt. If winners outnumber unforced errors I'm picking Fed in 3; 7-5 3-6 6-4. Allez! Serve back on song, moving better than ever. Successfuly avenges Basel. Allez! No hesitation from the GOAT today. 1 click and it’s done! Third is a good effort, and you backed it up with a title on the next. Allez!!!! I knew it! What a great win, it was a fantastic Match throughout, I got the feeling at 4-5 in the second that Juan would take the set, but in the third Roger played in an incredible level, striking the ball with so much confidence, I did not even mind the break from JM, he was in the zone I knew he would break back … C’mon Roger!!!!! I was expecting straights even at 4-5 but just hesitated, played not to lose rather to win that game. Luckily he turned it back on when he needed to. Considering Roger said that Paris is playing faster than Basel, it should be an advantage for Roger. Djokovic is getting really good indoors but I think Roger can get it done tomorrow. I’d say Roger is 6-4 to win. I guess it all comes down to which of the two want to invest energy in this event with the impending tour finals. Yeah it’s always been a good matchup for Roger… 12 months since they last played, if anything the match will be a good barometer. That is the dilemma! Whoever plays Sunday final I believe gets Monday off but think fed wants to keep the momentum! Key ranking points here to keep high enough for start of 2014 for which I am getting v excited! Hope so Conal, I got a bit carried away in my post, Djoker is looking good so will be difficult but I do think Fed has a good chance. Donts let’s get carried away! He can win, and Novak has no Delpo power to overwhelm him but Fed has to play similar to today! He cannot out rally him from the baseline! Ps Nadal was frighteningly gd today! And kudos to Ferrer, what a fighter he is! Need more air between Fed and Berdych who appears to be going backwards! Didn’t see Nadal, but to be fair Gasquet is never going to beat him. Great win for Roger, Del Potro is in excellent form generally, so this is a good marker for Fed. I think Djokovic will be a bit too tough for Roger, his consistency will draw the mistakes out of Roger’s game but even if this happens, Paris has been a real positive coming into the WTF. Ultimately I’m more concerned about getting his form into something like it should be before the AO, and this will help no end. Roger has an advantage on this surface. Not a guaranteed win, but a bigger chance than other surfaces. Watch out for a very aggressive brand of tennis from Roger tomorrow. Surface and matchup both work in his favour… if the backhand holds up and he hits down the line with it then could be some very eye catching shots. Agree and to be fair, Stan was poor today except for first 3 games for which he got no reward! Yep and it happened thus, plus Fed took his foot off the gas at 1-0 in the 3rd. Looked a little put of ideas at the end but by then Novak but his metronomic best and Fed on train to London plotting how to beat Delpo again!! I need to watch the second and third sets now. Knew Djoker was going to hit back but thought Roger would be in control. Part of the plan maybe? I’d love another win over Del Po. Roger’s lost both their meetings at the O2 so it should get interesting. so happy to see roger2012 (at least) is coming back, i didnt put much hope on roger , esp the same opponent beaten him last week. Again Djo is a lot tougher than Delpo, i only hope to see a competitive game, like a 6-4 sets. Competitive sets? Pfft Back your player Eric! Allez. …DP is a class act. Interesting Fed’s play since Annocone split. I wonder if there is a clarity of conviction and direction benefitting Fed right now. It’s clear his assessment of his troubles are centered on the injured back and not – for instance – his racquet size. Maybe issues like that had cluttered his confidence some. Maybe having one less voice in the camp is unifying direction. Not that I know a thing about it, it’s just interesting to me that his play seems noticeably different – IMO – since their split. I agree. He seems to think less and think with more clarity. Hmm I dunno, I think Roger’s form is the result of hard work not due to having no coach, things kinda started looking up in Shanghai when nobody knew about the split, he loses to Monfils and people assume they split off the back of it, they decided it in a training block, so Roger’s known for months they were coming to an end. The truth will set you free. I think Roger is playing better because of this. He sat down with the media and explained his situation in 2013. He told the truth….his back has been a big issue this year. He stopped saying it was just a small thing. He admitted he had made mistakes. He should have pulled out of tournaments, cancelled others. I think this has freed him up to be himself, vulnerable as hell. His authentic self. I’m always learning from him. Well-said, Sue. I’m totally with you! He is an inspiration for me even though I have much longer life experiences than he has. His down to earth attitude is one of his quality. Hey just read that Chase article trying to stir things between Fed and Murray! Idiot! Chase is quite possibly one of the worst Journalist in Sports. The guy used to write inane articles for Yahoo awhile back and the comment section then used to rip him apart each time. After awhile he disappeared. Though I see he has now moved over to USAToday. Never read him. Simon Reed was always the worst I thouht on Yahoo. I ignore main stream press anyway, waste of time. Yep! He was v honest in that Swiss interview before Basel! Has really cleared his mind being able to put that info out in the public domain and then show the results of improved health, nothing else. Did you guys see Fed shaking the camera after signing it? Lol, such a dorkerer. It was a fantastic match, loved it. Joy to watch him play like a God when his fitness, mind and skills in harmony. I know my hope is glowing too rapidly but would love him to win against Djokovic. Unfortunately I can’t watch tomorrow live so no chat from me, either 🙁 Have a great weekend guys, enjoy the match. Thanks for the post, Jonathan, you spoted on everything, well-written. Yeah was he trying to simulate a rollercoaster as the match was quite close? And from me, not least for regrouping end second set, redeploying the slice which he temporarily abandoned , and breaking Delpo to finish the match! Needs that slice v Novak! Does anyone know a good website to find interviews after matches? I was just about to ask if anyone had a link to the post-match interview and here it is. Thank you Scooter. Scooter I hereby appoint you Head of Press conference videos and transcripts. Thks! How do you find them? Scooter has a very particular set of skills, skills he has acquired throughout a long career of searching YouTube. Happy Birthday Trudi, hopefully Fed delivers! Happy birthday! Gorgeous tennis from our man today! First set I shall watch and re watch! What joy! Happy birthday fellow fed fan, let’s hope Fed is feeling generous and can give you that gift! Happy birthday Trudi !!! May you get the birthday present you want (do you hear us Roger? Make it happen for Trudi)…. What a joy it was to see Roger play the way he did today, in that first set especially. The Fed in full flight is quite a spectacle. Got a bit worried in the second set so was really happy to see him pull himself together and get on with it. Was funny following live chat today because I was watching on Tennis TV and realised the transmission is a good minute behind – if not more. I was also listening to the commentary on a lemon TV stream and following the live chat so had 3 different stages of the match covered simultaneously. Nearly did my head in 🙁 But it did mean I knew Fed had won it before he had – I think (scratches head). I have high hopes for tomorrow. But if Roger loses I don’t mind because he’s really proved something today. Hope he feels that way too. It might even be a good thing to have a couple of days rest before London. 1st set was JesusFed levels pretty much. Those 2 drop shots back to back when he consolidated the break were just too good. Points behind second serve not gd enough! Au reboot Paris, Hello London and Novak take 2 Tues evening! Guys can you believe it? I said in Shanghai the only way we would know if Roger turned it around would be if he carried the momentum and was consistent. Now we can definitely say that the Fed is BACK. The first set was an absolute clinic, Goderer performance right there, something we haven’t seen a lot this year. Roger’s first top 5 win of the season as well. I actually jumped off my couch after he got the break in the third set and wrapped it up. The serve is popping more than ever and all the hard work is paying off, so proud of Roger, silencing the doubters once again and all our support and patience being rewarded too. I might be getting carried away here but I don’t really care because this win was much needed not only by his standards but for us as well, lets us know he’s still there ready to get out on court and make it a match. Whatever happens from here on in is icing on the cake. I would love to see Fed beat Djoker but as you said it all depends on the serve. Djokovic is the best returner out there, not sure what to expect. If Fed can take the first set, he’ll have the edge for sure and would have the confidence to taken on Nadal (sorry Ferrer but you’re not defending your title). I absolutely love the Fed/novak match up, hope it’s gonna be a good one! Allez, welcome back Maestro! He just gotta make Djoker doubt himself. Not easy to do these days but variety is key. Yep and rather lost that variety after mid second set but mainly because Novak gave him less time. I don’t know what to expect ahead of the Djokovic match. Here’s hoping that he can make a match of it but I don’t think he will win, Djokovic has been unbelievable ever since he lost that US Open Final. Federer has showed this week that he can still play well when the pressure is on and he’ll definitely need all of that if he’s to pull off the win tomorrow. Fingers crossed!!! I think Fed has a shot indoors here. Allez! The only lower seed in a match up to win today was Roger. Proves that he truly is in the top 4, and considering how bad a year we think or see he has had, that means something. I guess London is more important in terms of next year as it will give him a chance to play top 8 guys back to back. I subscribe to your philosophy. Even if he doesn’t win it all, he could potentially play nearly everyone above him in the rankings. Well now we know! Probably heard the draw and thought need energy to beat Delpo again and Novak!! Tougher than tough group! I hear Delpo had all his bags and passport stolen at Gare du nord! Maybe the alternate will hv to play! Allez Roger, backing you to make the semis! In fact, my predictions are Nadal and Ferrer, Delpo and Fed! Brave eh! Really? Friggin’ thieves! I think exceptions can and probably will be made for him. Wait…so does that mean Djokovic won’t make the WTF semi? 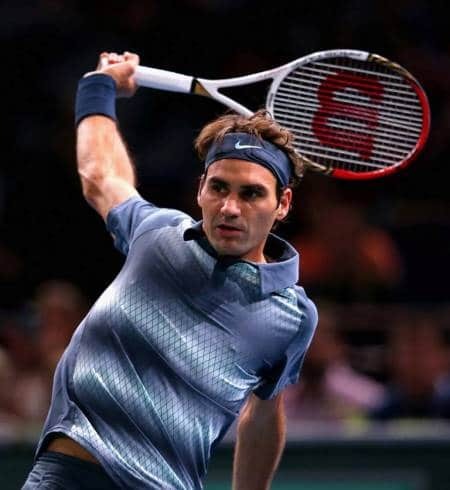 I heard a commentator say Roger hasn’t played HIS game much of this year, but has been trying to play the hard hitting, baseline power shots, going for quick winners, rather than the more controlled, full of variety type game he’s incredible at. Maybe Annacone was trying to get hum to play that way, and now Roger has realised it’s just not his style. He certainly seems freer, but I’m sure a lot of that is also just confidence. Whatever the case, it’s just nice to see him playing so well & consistently again. It just feels like he’s regained the instinct to know what shot to play, and confident enough to play the point out till he has winning shot opportunity. 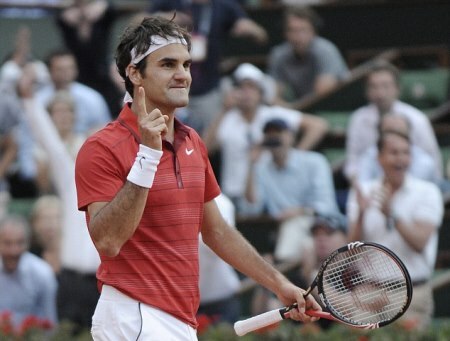 after a long time i watched the whole match, and federer was at his vintage best…. PS Sid if I were having a party you would be first on the guest list !!!! Betterer haha. Roger Federer getting betterer everytime I see him play. Sending good vibes Roger’s way that’s for sure. I’m mindful though of what he’s said recently about how once his body took half an hour to recover from a match and now it takes four hours – even four days. And also of what Rod Laver said about how when he played past his prime (tennis player prime that is) some days he would play brilliantly and other days nothing worked and he just didn’t ever really know why. And Tracy Austen said after Roger’s loss at Wimbledon this year that after 10 years (15 years in Roger’s case) of playing tennis you just cannot go out and play your best with the same enthusiasm every time. It’s just not possible. But I’m playing devil’s advocate here. Allez Roger! We’re all with you. Does that mean you’ve put a £1 on Djokovic to win? What bet against Roger? Never! If he lost I would feel guilty for the rest of my life. No bets today. I’m giving up gambling. The WTF draw is apparantly at 2pm today, anyone know of a TV or radio link to it? Always suprises how massive this tournament is, yet how little interest the actual draw gets. It’s like fans are not really supposed be interested in which matches they purchased tickets for months ago! Nadal has a joke group as ever! Fed now gets some rest as think he will play Monday! Disappointed but ok with it! Points on 2nd serve poor! Novak found his range to give him credit. Roger will be plsed with his week, grabbing some points as will lose lots next week and drop back to 7! Still think he will make semis in London but has to beat Gasquet and Delpo. No excuses! And who the hell comes up with these draws? Dull’s bloody uncle??? 3 of the best players in the world in one half? To be fair no 1 seed always has easiest draw! Novak won’t be relishing it either! All to play for! Come on Ferrer! U deserve this win, super aggressive play! Come on Ferrer!!! Never hv I wanted him to win as much as today! Sooo aggressive! Knew it! It may have sounded like a crazy prediction, but it really wasn’t that crazy 🙂 I’m going to watch this match later just to see if Nadal threw it away. Just looked up their H2H in 25 matches. They’ve played 18 times on Clay with Nadal winning 17 of them. They’ve played 7 times on Hard and Carpet courts, and Ferrer has a 4-3 advantage. But here’s the kicker: In their last 13 meetings, Nadal has won all 11 played on Clay, and lost the two on hard courts. When will all those idiots wake up and realize that clay is the only reason Nadal has built a winning H2H against virtually everyone. I had only tickets for afternoon session of Monday, so rushed to get same for Tuesday. I expected to have a more romantic last night in London cause Wednesday I m going back. Same as with Delpo : Fed s not loosing back to back matches to anybody within 4 or five days. And that s good news for me!